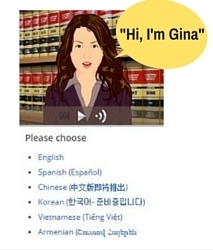 Gina, Los Angeles Superior Court's online traffic avatar, speaks six languages. The Superior Court of Los Angeles County handles some 1.5 million traffic citations a year. Two years ago, in the midst of the state's budget crisis, the crushing load of traffic cases had created a traffic jam inside LA courthouses—long lines. People were waiting as long as 2.5 hours to see a clerk. Now, typical waits in LA's busiest traffic court are approximately 12 minutes. The court re-engineered traffic court services, deftly and creatively, using technology. Snorri Ogata, the court's chief information officer, shared this Access 3D success story at a recent Judicial Council meeting. He summarized ways that technology helps the court improve physical, remote, and equal access. By surveying thousands of court users, staff discovered that the vast majority of those waiting in line could complete their traffic transactions online instead. Technology and traffic court staff got creative. They reprogrammed their 35-year-old case management system and overhauled their website. Those with traffic tickets can now pay fines at any courthouse that handles traffic matters, not just at the courthouse where their case was assigned. Five courthouses now have traffic kiosks providing service around the clock, seven days a week, that can handle cash payments along with many other traffic citation options. Courtesy notices were revamped to make recipients more aware of online services. Convenience fees for making payments online were halved, making this option more affordable and inviting. Better online tools for judicial officers and justice partners streamline their traffic court work, saving time and paper. Gina, an online avatar for traffic court services, now helps 4,000 customers a week handle their traffic citations online. Gina is getting smarter. She has now become multi-lingual, with her guidance translated into six languages. Now more people access LA Superior Court's online services than walk through courthouse doors. Mr. Ogata also previewed coming improvements, which include better services for mobile phone users and an improved online appointment system.